Let me tell you a little story about my cooking journey. If you’ve been around here for any amount of time, you know I got married young and didn’t know how to do anything domestic. Housework? Huh? Laundry? Oh, I can do that every few weeks, right? Cooking? Only if it comes from a box. Yeah, I had my work cut out for me. The first thing I ever learned how to cook was chicken noodle soup. It sparked the beginning of my love for making soup. Now, I love all kinds of soups. They are frugal, economical, hearty, and delicious. 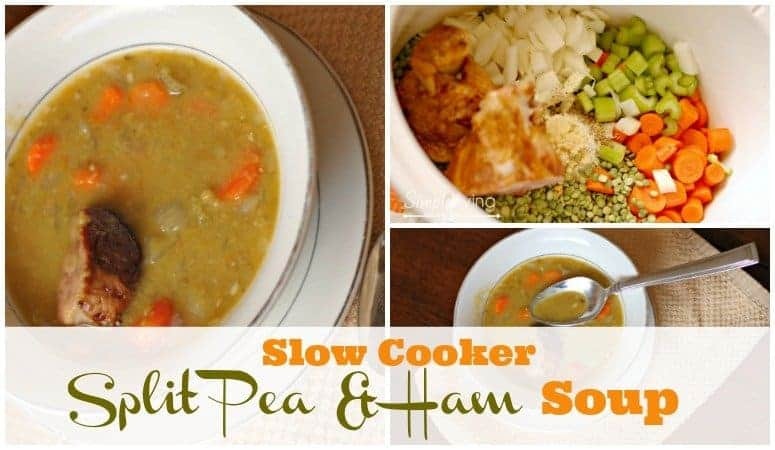 One of my all-time favorite soups is this slow cooker split pea soup with ham. The ingredients are relatively inexpensive and it’s just do delicious and filling. My entire family will chow down on this soup. It may not look like much, but it tastes great! 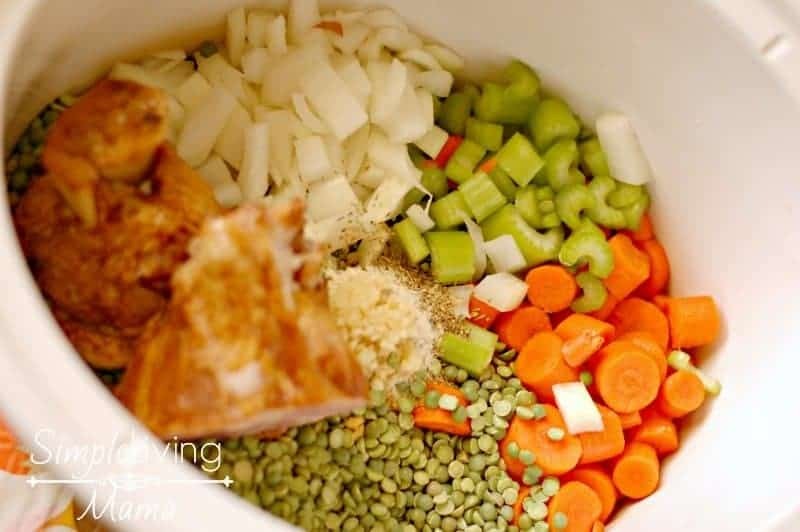 Place all of the ingredients in the slow cooker, and cook on low for 8 hours, or high for 6 hours. 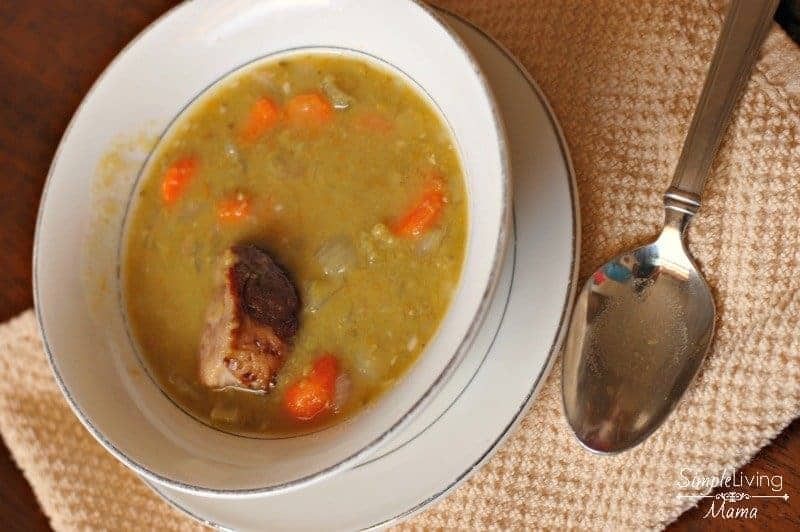 I prefer to use ham hocks because they add a delicious, smoky flavor to the soup. They fall apart at the end of the cooking time, so you should remove any bones and also break up the ham so that everyone gets a few chunks. Ham hocks are also very affordable. I bought a pack of four for $6. I used two in my ham and beans recipe, and two in this soup. You may need to ask your butcher if they have ham hocks if you can’t find them easily. You can also substitute with diced ham or bacon. It’s amazing how much the peas thicken up. The eight cups of water kept our soup a bit on the thinner side. If you want a thicker soup, use less water, but I recommend checking on the soup throughout the day to make sure it’s not getting too thick. I prefer a thinner soup, myself. 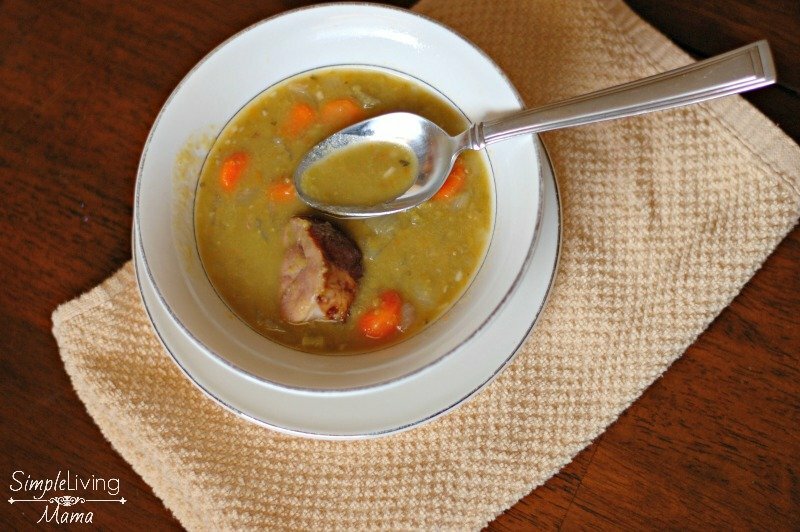 This slow cooker split pea and ham soup goes great with my cornbread, or even some rolls or my homemade white bread. This recipe makes enough for our entire family to have another bowl for lunch the next day. Such a delicious and hearty meal! 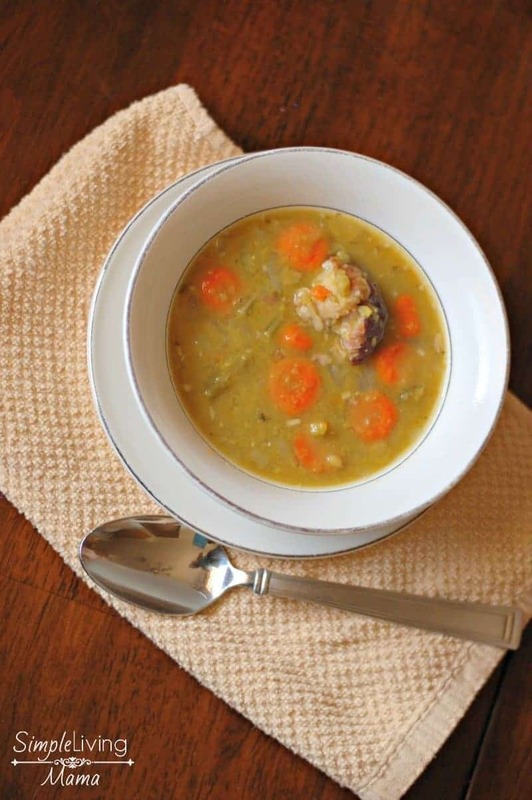 A simple and delicious slow cooker split pea and ham soup recipe. Cook on low 8 hours, or high 6 hours. Remove bones and shred ham before serving.